This post has been originally published on April 9, 2018 and has been extensively revised and updated on April 17th, 2019. Sometime during your senior year of college, you’ll start the process of applying for your first ever, entry-level job. Even before then, you may send out your application to take part in important paid internships, or obtain other work experience relevant to your chosen career path. As you begin seeking your first job, your resume is one of the first challenges that you’ll have to tackle. 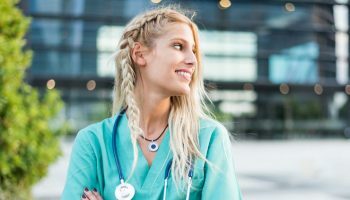 How do you represent yourself as being qualified when you don’t have years of work-related experience? Here are some tips for doing just that. 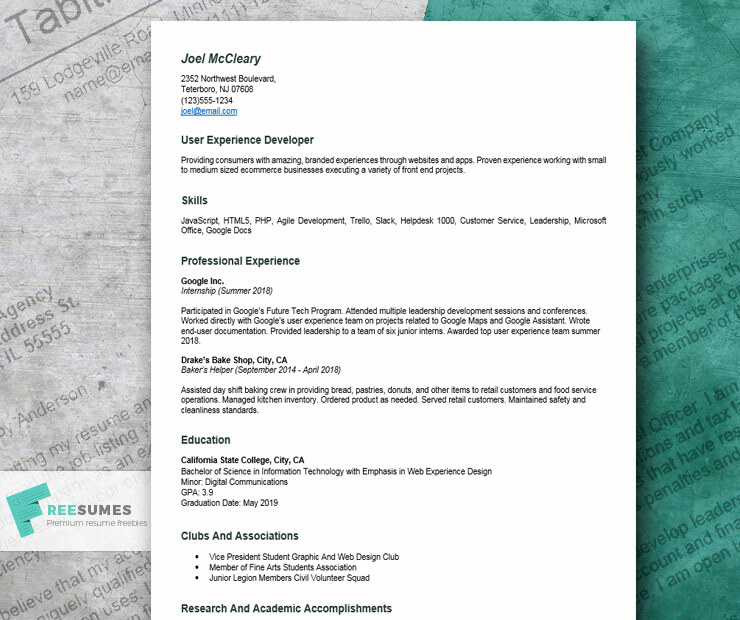 Keep reading, we’ve also included a resume example for college students below. 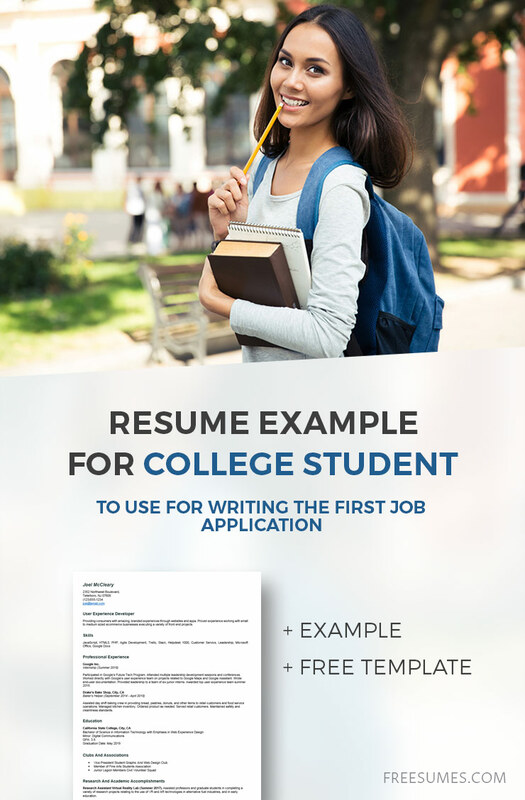 As a college student, you need to approach your resume writing a little differently than someone already working and looking to change their job or career path. You should try to put more emphasis not only on your work history but also on your educational experience too. 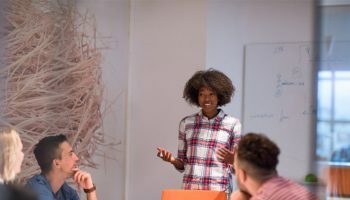 It can be difficult to demonstrate your skills to someone when you haven’t got a lengthy work history, but highlighting your experience of any volunteer work that you have undertaken as well as any relevant extra-curricular activities that you think would help add value to your resume will certainly help. Anyone hiring a college student for an entry-level position is going to expect their resume to lean heavily on academics. This is perfectly acceptable. Don’t hesitate to include your achievements, your GPA, and any volunteer or research work you did that helped you to develop relevant skills and experience. Of course, it is perfectly acceptable to include any internships or externships as work experience. You may be wondering if you should include any extra-curricular activities on your college resume. After all, would a potential new employer really be that interested to know about these things? You should include your extra-curricular activities simply because you may have very little actual work experience to backup your resume with. Doing activities outside of the college environment can show a potential employer that you have good skills and abilities to bring to the role. Whether you spent time as part of a club or sporting group, did some volunteering work or walked and took care of your neighbors’ dogs, you would have developed some good interpersonal skills, prioritizing and organizational skills that can be very valuable. You should also mention any examples where you took on a leadership role. If you managed or organized a club or a team, you can demonstrate that you have the ability to lead. This shows an employer that you would be able to handle more responsibility in your role in the future. While it is important to include any relevant work experience or jobs that you have done, don’t forget that any sort of work experience can be beneficial to mention here too. You pick up all sorts of soft and hard skills from the work that you do. So even if you held down a job that isn’t directly related to the post you are after, if you learned some valuable transferable skills from doing the job that will come in handy in your new role – list them! When jotting down this section, focus on detailing two things. First, explain the work you did in terms of your accomplishments. For example, if you worked in a fast food restaurant don’t state that you mopped floors and wiped counters. Instead, mention that you maintained high standards of safety and cleanliness without the need for direction or supervision. Next, list the skills that you gained from the jobs you had. 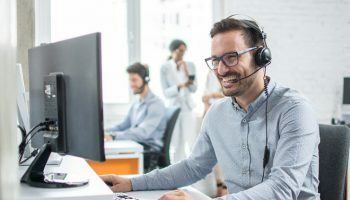 Even if your work was limited to working in retail, at restaurants, or at other jobs common among college students chances are you learned customer service skills, how to answer a business phone properly, basic computer skills, etc. You may have even developed leadership skills during research projects or at work. This is true for every job seeker, but even more so for college students. You may be facing some unfair bias that as a young person you aren’t capable of professionalism, or have sufficient work ethic. Silence those future critics by submitting a well-written resume with impeccable spelling, grammar, and formatting. Make sure you edit your resume more than once. In fact you should edit, edit, and edit again! Get someone to proofread your resume carefully for you or make use of a grammar checker such as Grammarly. Having a fresh pair of eyes look over your resume will give you a chance to pick up on any missed typos that your brain doesn’t see. Your college resume isn’t the place to be modest or reserved about your talents. You need to make yourself stand out from all the other generic applications coming through from others. You can do this by using strong action verbs to make a more powerful impression. Wording your resume with action verbs will help to make your experiences sound more dynamic and responsible. This will help your resume to look more energetic to the eye and make you stand out better than an applicant using a passive or modest voice. Hence, avoid the weak words like ‘did’ or ‘went’. Instead use power words like built, researched, developed, planned, and led. While on the subject of wording your resume, remember to quantify your statements wherever possible. Break up the text with numbers to better demonstrate your achievements. 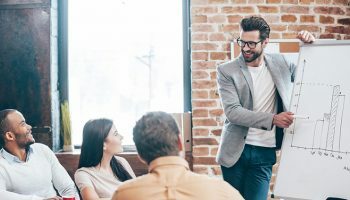 For example, rather than say that you volunteered as a cashier in a visitor center, instead say that you helped between 80 to 100 customers per day, handling cash sales and customer queries, in a busy gift shop within a popular visitor center. A good resume should be paired with a great cover letter. Your cover letter will detail your enthusiasm and interest for the job. You can also mention your availability, and desire to schedule an interview. Even if you take on-board all of the above tips, it can still be difficult to create your first resume layout. 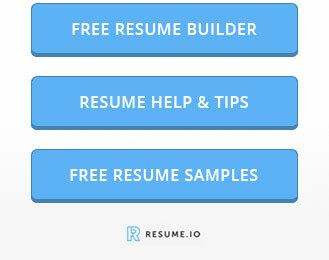 Using a good quality customizable resume template is just like using a guide to help you through creating your own resume. Take a look at our helpful guide about choosing the right resume template to suit your needs, with examples of our professionally designed free to use resume templates. A template can help you to organize your content as well as show you where to include it. Formatting is very easy and you can tailor your resume template to become quite unique and individual, yet give it a very professional and organized edge that employers like to read. Providing consumers with amazing, branded experiences through websites and apps. Proven experience working with small to medium sized ecommerce businesses executing a variety of front end projects. Participated in Google’s Future Tech Program. Attended multiple leadership development sessions and conferences. Worked directly with Google’s user experience team on projects related to Google Maps and Google Assistant. Wrote end-user documentation. Provided leadership to a team of six junior interns. Awarded top user experience team summer 2018. Assisted day shift baking crew in providing bread, pastries, donuts, and other items to retail customers and food service operations. Managed kitchen inventory. Ordered product as needed. Served retail customers. Maintained safety and cleanliness standards. Research Assistant Virtual Reality Lab (Summer 2017). Assisted professors and graduate students in completing a variety of research projects relating to the use of VR and AR technologies in alternative fuel industries, and in early education. Use the tips and sample provided above to help guide you as you work to write a resume to land your first job. Remember to focus on skills, academics, and other accomplishments. Don’t fret over lack of job experience. Everyone starts somewhere, and a well-written resume can be your launch pad. 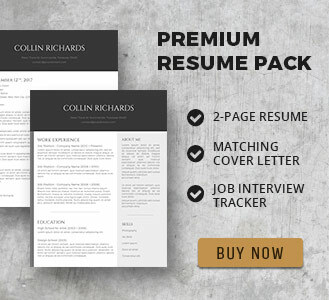 And if you have troubles with relaying all your personal information, grab one of our best resume templates!